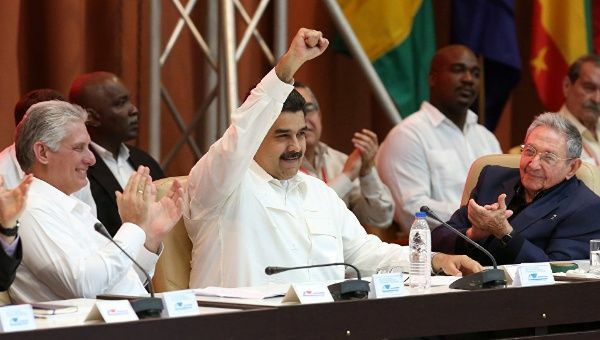 April 19 (teleSUR) Venezuelan President Nicolas Maduro Thursday congratulated the Republic of Cuba and its new President Miguel Díaz-Canel for the democratic and participatory appointment of their legislative and executive authorities. In a release issued via the Foreign Ministry, Maduro expressed his deep admiration and emotional recognition towards Raul Castro, for the leadership of his people in recent years, consolidating independence, progress and the socialist project in Cuban society. He also thanked Castro for his leadership in the world, promoting respect for international law and promoting regional integration processes. “Comrade Raul Castro has more than honored the enormous responsibility entrusted by the Cuban people to take the witness from Commander Fidel Castro, performing with wisdom, loyalty, and courage; as he did in all the tasks that history put him in front, as a combatant of a thousand battles with Fidel, since July 26, the Granma and the Sierra Maestra, with the triumph of the Revolution, for almost six decades of anti-imperialist resistance and integral progress of the Cuban people,” Maduro said. During the recent years, Castro and Maduro, strengthened the union between Cuba and Venezuela, while consolidating and strengthening of the Bolivarian Alliance for the Peoples of Our America (ALBA-TCP) and the Community of States of Latin America and the Caribbean (CELAC) honoring the vision and legacy of Fidel Castro and Hugo Chávez.